We all remember where we were on September 11, 2001. For so many of our sisters and brothers, the tragic events of that day were just the beginning of a long struggle that continues to this day. When the towers fell, union members in New York rallied to Ground Zero to search for survivors and clean up the aftermath. There were police officers and firefighters, of course, but it was IATSE members who placed and operated the lighting equipment that allowed the search and rescue operation to continue 24 hours a day for weeks. The dust that we inhaled in those days has led to complicated health issues for many emergency responders, and many of us are still dealing with the aftermath. After the attacks, the Federal government set up the September 11th Victims Compensation Fund, which authorized medical treatment and monitoring as well as economic compensation to those injured at Ground Zero, the Pentagon, and the Shanksville crash site. Despite the ongoing issues many responders still have, that funding is scheduled to run out unless Congress acts soon. We need people from all across the country to urge their representatives to cosponsor the Never Forget the Heroes: Permanent Authorization of the September 11th Victim Compensation Fund Act (S. 546/H.R. 1327) to ensure that everyone affected by the attacks can receive the help they deserve. Will you contact your representative today? When you click, you’ll be taken to renew911health.org. Enter your address in the bar and click “Submit” to find your representatives and see if they are currently cosponsors of the bill. (It sometimes takes a moment to display your results. Please be patient!) From there, you can click on each representative to see their contact information, and you can even enter your phone number to be connected directly to their office. The site has suggested scripts both to thank your representative for cosponsoring the bill, and to urge them to do so. This is not just an issue for New York residents. There are more than 45,000 people struggling with illnesses or injuries caused by the attacks. They live in every state and 434 out of 435 Congressional districts nationwide. Many are disabled and can no longer work. They are suffering from a host of chronic diseases: asthma, obstructive pulmonary disease, and gastroesophageal reflux disease, to name but a few. Medical research has identified more than 60 types of cancer caused by 9/11 toxins. Over 10,000 9/11 responders and survivors have been diagnosed with cancers caused or made worse by 9/11 — a number that is sure to grow in the years to come. 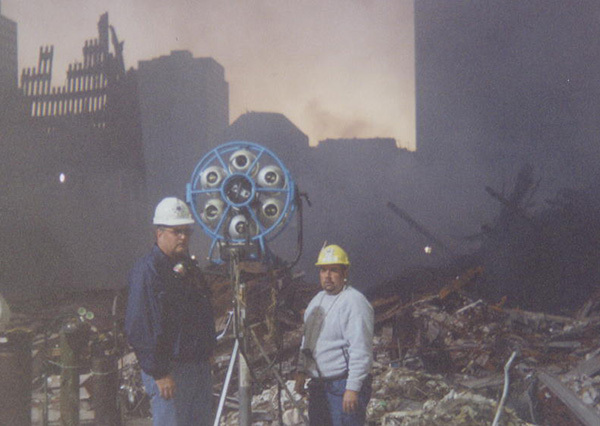 The IATSE didn’t just show up at Ground Zero. Members volunteered their time for memorial services across the city, and worked to help rebuild in the aftermath. This is personal to me, because I was one of them. Will you stand with your sisters and brothers who stepped up when the country needed them? Urge your representatives to cosponsor the reauthorization of the September 11th Victim Compensation Fund and make that funding permanent.